Do you promise you’ll always be here for me? It was a game they played, only it wasn’t a game. Maggie Marks held on to Elijah’s childhood promises as a way of escaping a life that was far from perfect. Elijah Lugo was her neighbor, her best friend, her family. He was everything her parents refused to be, everything she needed. He was her first kiss and a witness to more of her father’s drunken rants than she could count. He was there at her wedding and then held her when it all fell apart. Elijah was in love with her, but she was afraid loving him would eventually mean losing him too. They were no longer kids, pretending everything would work out in the end. When Maggie’s father reenters her life in an unexpected way, revealing long held secrets, her world is turned upside down and she will need Elijah more than ever. A story of friendship and family. The promises you make and the ones you keep. In 'Promises,' by Michelle Lynn, main character Maggie struggles to find her footing after a troubled childhood and difficult marriage. Her past continually comes back to haunt her, from her father to her ex-husband, who also happened to be one of her childhood best friends. The only thing that remains steady in her life is her relationship with her other best friend, Elijah. His promise to always be there for her no matter the circumstance has never weighed on her, but she is finding herself questioning if their relationship is as it should be, or if it should maybe be something more. Despite the predictability of much of the storyline, it does not struggle to keep readers' attention. The best sections of the novel revolve around Maggie and Elijah's relationship, as well as Maggie's journey to come to terms with her past and the father she felt the need to escape from, and to keep her cousin Jason safe from, too. The secondary characters in the story - namely Michaela, Jason, Chris, and Josh - helped add some levity to the story, but Maggie's own sense of sarcasm didn't hurt in that area either. Elijah's desire to care for her and be there for her is abundantly clear, and his decision to give her time to figure out her life is a kind decision on his part, especially due to the fact that she is struggling to come to terms with her past. However, sometimes the relationships among the characters were not quite as clear as they could have been. They were obviously all friends, but Josh especially didn't stand out in terms of his connection to the rest of the group. However, for those who have read 'Choices,' his relationship will make more sense. Overall, Michelle Lynn delivers an engaging and romantic getaway in 'Promises,' in the same way she did in her first novel in this series, 'Choices'. The romantic scenes will make your insides ooh and aah, while Maggie's desire to find strength to move on with her life will at times bring tears. It is a sweet story that tugs at the heartstrings. Michelle Lynn delivers an engaging and romantic getaway in 'Promises,' in the same way she did in her first novel in this series, 'Choices'. The romantic scenes will make your insides ooh and aah, while Maggie's desire to find strength to move on with her life will at times bring tears. It is a sweet story that tugs at the heartstrings. 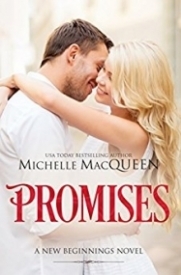 PROMISES by Michelle Lynn is a sweet and quick read. Let me first point out that PROMISES is an adult contemporary romance but has a strong Young Adult crossover appeal. The main characters, Maggie and Elijah, are still young enough that their story will appeal to younger readers and the writing style will feel familiar. PROMISES is an excellent follow up to CHOICES and introduces characters from CHOICES while seamlessly intertwining with new characters. Promises explores the question if men and women can really ever be friends and that’s just what Elijah and Maggie are – best friends. They’ve been best friends their entire lives and nothing has come between them. Until Eli can’t hold his feelings back any longer and even though Maggie knows she feels the same way, she’s not sure she’s willing to risk her best friend if things don’t work out between them. But deciding to be together won’t be the most difficult decision they have to make, not even by a long shot. Will this new couple survive all the things life is throwing their way? I loved the character of Chris in CHOICES and I really wish we had gotten to see more of him in this story. He’s more a straw man in this story and I hope that he’ll get his own story in the installments to come. PROMISES is a great contemporary romance with several different layers that all work together seamlessly. It’s a great addition to the New Beginnings series.